Director Asger Leth’s Man On A Ledge is a thriller with a twist. Starring Sam Worthington and Elizabeth Banks this is a film that is not how it first appears. High above Manhattan’s midmorning traffic Nick Cassidy (Worthington) is a man on the edge – literally, as he is about to throw himself from a 200ft ledge to the street below. However, as police negotiator Lydia Mercer (Banks) arrives to try and coax him from the brink, it emerges that all is not as it seems, and something even bigger is going down behind their very backs. 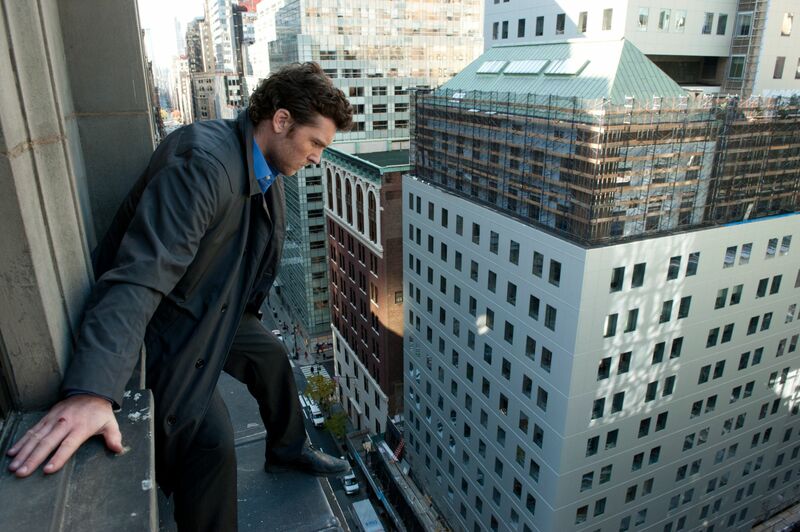 Man On A Ledge is as much a psychological thriller as an action one. The relationship Bank’s builds with Worthington as discovers who he is and why he’s wanting to take his own life, is as important as what’s taking place across the street, and the juxtaposition of the parallel story-lines, if not totally original at least manages to hold your attention for the film’s duration. The psychological aspect is further seen in the reaction of the crowd who gather on the street below to watch the unfolding drama. With TV cameras following a reporter out for her big scoop (a feisty performance from Kyra Sedgwick as a Gail Weathers clone newsgirl), the film can also be seen as a comment on modern societies obsession with the immediacy of the here and now and reality television, of which a live suicide would be the pinnacle. That said there’s no shortage of action. Filmed on location at the Roosevelt Hotel on New York’s Madison Avenue you feel the city’s buzz, whilst the scenes on the ledge 200ft above the midtown traffic have a giddy air of authenticity due in no small way to the fact that it was real – in a recent interview Banks said that Worthington really did step onto the ledge, so perhaps he wasn’t having to act too hard to look petrified. The hi-tech setting where the parallel story featuring Jamie Bell and Genesis Rodriguez plays out is equally impressive though, without giving too much away, some of the predicaments the couple find themselves facing do smack of Tom Cruise’s early difficult assignments. Though hardly taking the action thriller to new heights, Man On A Ledge certainly provides some genuinely edgy fun.